We’ve been away for a few days which has meant I haven’t been around to come up with any new recipes. 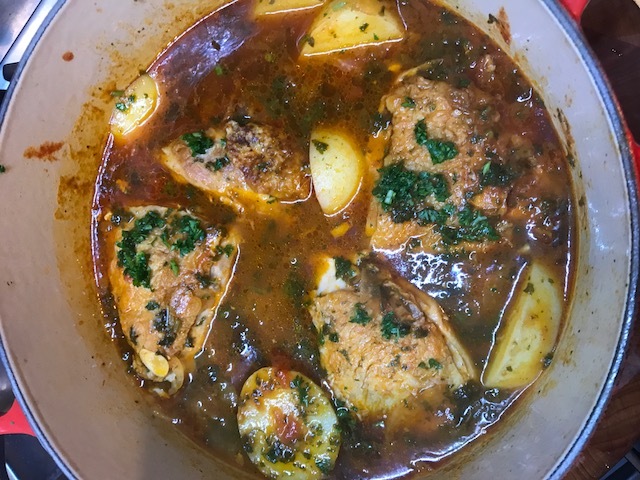 So, wondering what I was going to do in this slot today, Frances suggested I make Provencal Chicken which David Lebovitz published in his blog earlier this week. Last night I made my version of it. It’s very easy and is such a taste of Provence, reminding us of cooking aromas wafting from windows in small villages in the south of France on Sundays at lunchtime. Ideally this is a summer dish made with sun ripened tomatoes but as it’s the first day of Spring, Summer doesn’t seem so far away. It’s not a pretty meal to look at but the flavour is great. Season the chicken pieces with salt and pepper. Heat a little olive oil in a heavy pot or flameproof casserole dish. Brown the chicken pieces on both sides. Brown in two batches if necessary. Take the chicken out and set aside. Wipe out any excess oil and add the pastis. Let it sizzle for a minute then add the tomatoes, chopped garlic, fennel, browned chicken and any juices, sugar and enough stock to cover. Bring to the boil and then gently simmer for 10-15 minutes. Then add the potato slices and most of the chopped parsley. Check the seasoning. Simmer for another 15-20 minutes or until the chicken and potato are cooked. Sprinkle with the rest of the parsley and serve. There’s lots of juice with this so serve on rice or pasta if you feel like it. Otherwise just have plenty of bread to soak up the juices.